How long have you been building Decks? Over 30 years in Central Texas. Yes. We carry a multi-million dollar liability policy as required by our numerous home building clients. Yes. Beyond any manufacturer’s warranty, we offer a full year structural warranty on our installations. What are the available materials? We use traditional lumbers such as cedar, redwood, treated lumber (ACQ) and IPE (ironwood), as well as composite decking. For detailed information on all of these materials, please review our Materials page. Traditional woods have a warmer feel, are structurally sound but require protection from the rain and sun (weatherproofing). Composite materials will not splinter, decay or rot, but are not structural, require a tighter joist spacing. Yes, in most areas. A inspection will certify that your deck meets national building codes. We will be happy to obtain a permit for you. At Roadrunner Decks we are licensed residential building contractors. Is there a charge for designing and estimating? No. We will happily give you a detailed estimate. Just Contact Us to schedule a visit at the project site. What is your geographic coverage? 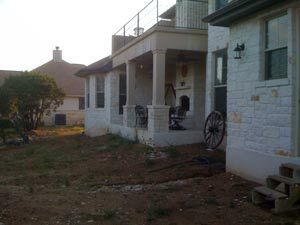 We serve Austin and all the surrounding areas of Central Texas. 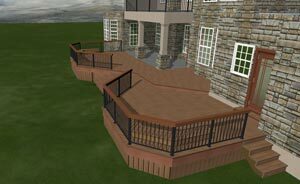 The price of a deck will vary depending on size, access, elevation, type of materials used, accessories, etc. Since estimates are free, we recommend you schedule a visit to the site so the cost determination will be accurate. We currently accept cash, credit cards and checks. How long will it take for you to build my deck? A typical deck will take a few days to a week to build and will be completed most often within three weeks from your order date. 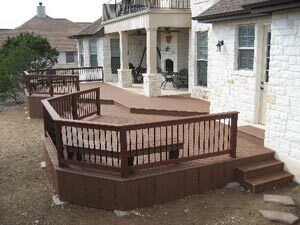 We offer full cleaning, pressure washing, mildew removal, sealing and staining, as well as restoration and repairs on existing decks, shade arbors and privacy fences. Please review our Services page for more information.